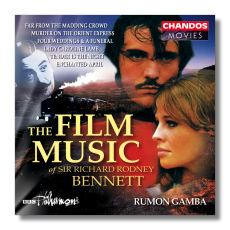 Chandos' series of discs devoted to English film composers already has honored Malcolm Arnold (CHAN9100 and CHAN9851), Alan Rawsthorne, (CHAN9749), and William Alwyn (CHAN9243). Bennett, who was born in 1936, is the youngest of these four composers. Four Weddings and a Funeral was scored by Bennett as recently as 1996, although the film is better known for its pop-based score than for Bennett's simple, effective contributions. I read somewhere that the great Bernard Herrmann (Psycho, Vertigo, et al. ), then at the very end of his career, was suggested as a possible composer for 1974's Murder on the Orient Express, Herrmann's alleged (but characteristically intense) reaction ("it is a train of death !") scared away the film's creators. If they were looking for a lighter touch, they found it with Bennett. Although the beginning of this 11-minute suite sounds like Ravel's La valse swirling up from the mists, the very English waltz proper sets the right tone for the witty and stylized writing of Agatha Christie and Sidney Lumet. Bennett's music for Far from the Madding Crowd (1967) follows it, in the form of a 15-minute suite. Here, Bennett depicts the rural Wessex atmosphere by blending pastoral impressionism with authentic period dance tunes and songs. The suite tells one everything that one needs to know about the film. Lady Caroline Lamb (1972) is a concerto of sorts for viola and orchestra. Bennett's writing is highly sensitive, with delicate writing for the harp and harpsichord, as well as for the violist. Lovely and memorable ideas bubble up in unforced profusion. The soloist, Philip Dukes, finds the right mournful tone for this story about an aristocratic woman's misguided love for Lord Byron. As expected, a gentle and reserved period atmosphere is evoked, but the title character's passion also is revealed by the music. "Nicole's theme" from Tender in the Night (1985) finds Bennett in a more popular vein. This brief excerpt (little more than two minutes) is billed as a première recording. The disc's longest selection comes from 1991's Enchanted April, This 20-minute suite contains a prominent role for ondes martenot, played capably by Cynthia Miller. There is something Debussy-like about this score, perhaps the French master's Prélude to the Afternoon of a Faun, The music shimmers in the haze, distinct at times, receding at others. It is another lovely bit of semi-pastoral writing, and a portrayal of passions delicately restrained. The disc closes with a brief "Love Scene" from Four Weddings and a Funeral – an introverted contribution that ends the disc on a quiet note. Gamba, who conducted the Rawsthorne and second Arnold discs, is a fine advocate for this music, and the BBC Philharmonic captures its evanescent beauties without pinning them down. The 24-bit recording is excellent, and the booklet contains film stills and a decent essay on the music by Alexander Gleason. This is recommended not just to film score fans, but to anyone who likes music that is easy on the ear but not insulting to the intelligence.